Cats need sunlight to grow healthy and strong. Similar to humans, cat need ultra violet from the sun’s rays to manufacture vitamin D in their bodies. Letting cats play outside in the typical Aussie backyard though is fraught with difficulties. Normal fences, whether wood or metal, are not high enough to prevent your pet from escaping and either getting lost, being attacked by dogs or being run over. Then of course there is the problem with our native wild life. Cats can kill innocent birds and small mammals, when left unsupervised outside. Who hasn’t had the experience of a small bird or some other small critter being left as a trophy on the back doorstep? The end result of all this is that most cats get to stay indoors all the time, especially if their owner work full time. While there’s nothing wrong with cats spending most of their time indoors, especially at night, keeping a cat in 24 hours a day, 7 days a week is probably not in its best interests. So what’s the answer for your feline friend (and for your own sanity)? Outdoor Cat Enclosures need not be expensive. These products are made of special and durable materials that will stay strong and last for several years. Cat enclosures for outside still need to provide some shelter from the elements, so a part colorbond roof is a good idea unless the are going to be located under a patio. These cat runs are suitable for kittens and adult cats alike. Perhaps the only prerequisite is that the cats can play well together and are not aggressive towards each other if they need to be in the same space for any length of time. 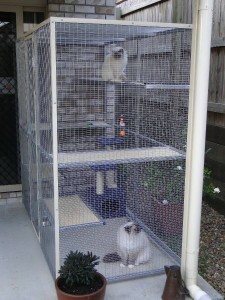 Where can I find cat enclosures in Brisbane? We can manufacture a run designed specifically for your cat and will provide them with the best option for outdoor freedom. These products are made from steel and colorbond and are durable and safe. Platforms can be placed wherever you want them and are usually made of plywood for comfort. The wire sides and top allow sunlight and natural breezes to enter. Large doors allow easy access for the owners to enter. It’s essential to hose out the cat enclosure regularly as cat urine is notorious for creating rust when left on metal surfaces for too long. The odor is also not the most pleasant, especially from a male cat who has not been desexed! Always ensure there is clean water and food for the cats and a few toys, such as cat trees, will keep them amused and happy. Cat lovers who have bought our products are happy with their purchases and say that it gives them peace of mind, knowing their pets are secure and out of the clutches of local councils who are really clamping down on wandering cats. Save yourself a fine and a trip to the cat shelter with a well constructed outdoor cat aviary! I have replied to your email information directly, asking if you make the cat enclosure in a kit form for interstate users. Can you please advise if you do, and prices?